Yes, it really is 400 millimetres in diameter. This is because it was built on a preformed disc of MDF (medium density fibreboard) which was on sale in my local D.I.Y. store. The radius of the main curve is something like 155mm and the inner siding is, well, tight! It has proved quite easy to build, the track, all built using code 40 rail and PCB sleepers (as detailed on the trackwork page), took a couple of evenings to put in place and wire up. The scenery was built up using a cardboard "egg-box" structure, over which paper hand towels soaked in PVA glue were laid. 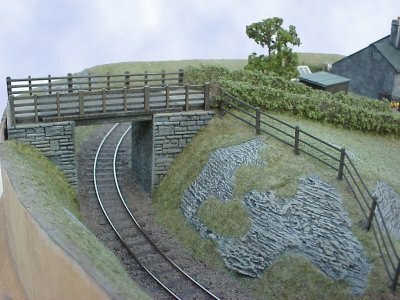 Track ballast is from Woodlands Scenics, ground cover is very fine flock fibres, as I am convinced that, in small scales, it's necessary to be quite restrained with textures. Rock outcrops are carved modelling clay (DAS Pronto). Since this photo was taken, a lot more detail has been added. It's been to several exhibitions and at each one it's created quite a bit of interest due to its size. I have vague thoughts about making a flight case for it and taking it along to one of the US Narrow Gauge conventions (The size limit for airline cabin baggage is no more than 450mm in any dimension...). 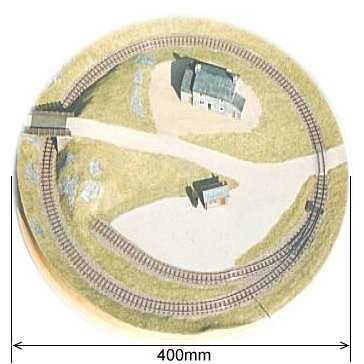 There is currently quite a bit of interest in building micro-layouts in UK and European narrow gauge circles (no pun intended!) but I strongly suspect the next layout I build in Nn3 will be a bit more expansive than this one. The nice thing with British outline Nn3 is that it becomes quite feasible either to model an entire line using only a modicum of compression, or to model a section of line exactly to scale. 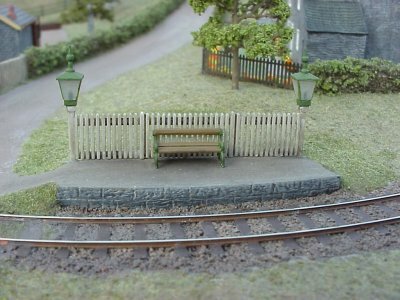 However one drawback is that there were not many lines built in England to 3ft gauge. The ones which immediately spring to mind are the Isle of Man system, The Southwold Railway and the early years of the Ravenglass and Eskdale. There were a few industrial lines to 3ft and metre gauge, but again very much in a minority. Ireland, of course, had plenty of 3ft gauge lines. Indeed it still has over 1000 miles of 3ft gauge serving the Irish Turf Board (Bord na Mona). So this may be a fruitful area to model, certainly the prototypes are very attractive and the scenery is superb. The layout makes use of available bits and pieces, in fact, pretty much the contents of my "oddments" box. 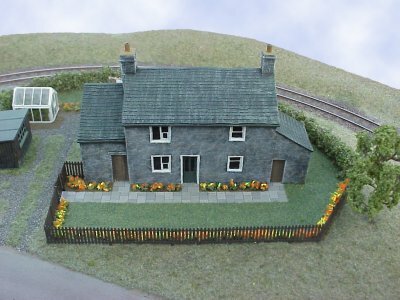 The yard hut is a Ratio plastic kit and the farmhouse is a solid resin casting by Shire Lane which I was given as a review sample. To ensure consistency, all the stonework is painted in the same way - an initial coat of matt black and then dry-brushed with matt white, light brown and for the rooves, a hint of green, as slate tends to collect a certain amount of moss. At first it looks hideous, but successive brushings moderate the matt black and bring up the desired colour and texture. The black is done with oil-based enamel and all other subsequent painting is done with acrylics. The hedges are made from strips of industrial scouring pad painted with glue and dipped in ground scenic foam. Other fencing is etched brass or moulded plastic. The yard has a gated siding and the gate will actually move on its pivot. Trees are etched brass frames coated with a hot glue gun and then sprayed, before laying on segments of Woodlands Scenics foliage. Since the photos were taken, I've added a lot more detail including a small passenger facility. It's probably getting to the stage where I should stop before the whole scene becomes too cluttered. Here are the simple freight facilities, really just a single siding. The rail is painted all over to represent rust as would happen on the real thing, so locos cannot run along the siding. 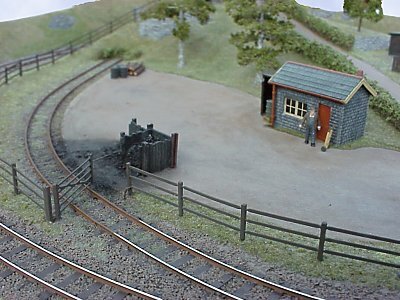 In any case, the opening gate is too narrow for the locos to pass, so shunting has to be performed using a string of wagons to reach down to the end of the siding. The gate and fencing are etched brass and the gate pivots on some brass wire running in a tube let into the baseboard. The front of the farmhouse. Someone is a keen gardener, judging by the display of summer flowers. 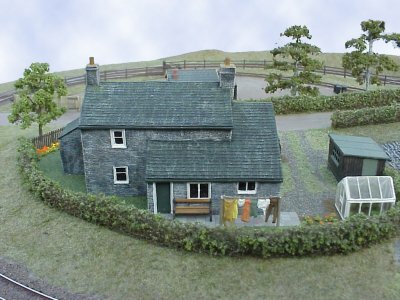 The building is a solid resin casting from the Shire Lane range. These can be quite heavy so it's bolted to the layout with a length of 6mm studding. 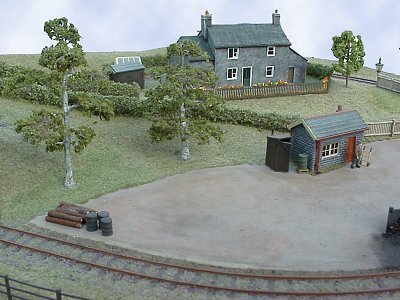 Another view of the goods yard. It's obviously a quiet day today! The "bridge of size" (sorry about the awful pun!). This is what restricts the size of the stock running on the layout. Not only is it short, but it's awkwardly mounted on the curve. The rock face is carved from DAS Pronto modelling clay. Round the back of the farmhouse. It's washday, so the lack of trains right now is probably a good thing. The greenhouse has a fine crop inside it, not quite sure exactly what. You would not want to wait long for a train here, with only a bench seat for comfort. Wonder who lights the lamps?